...with nothing but your Ninpo/Budo Taijutsu Skills?" No falling back on caveman-style, or whatever else you might have learned before? Just good, solid, street-ready Ninpo-Taijutsu that will work against a bar fighter, drunk, criminal attacker, gang-banger, or MMA fighter? Because that's what it takes to Earn your Nidan (2nd degree Black Belt) in Ninjutsu from Shidoshi Miller! NOTE: DO NOT use the PayPal link below if you are one of Shidoshi Miller's Musha Shugyo students. This bootcamp is already a part of your training & rank advancement program! Join Warrior Concepts founder and Bujinkan master-teacher, Shidoshi Jeffrey M. Miller for an intense weekend of advanced training in the Ninja's combat method as passed down through several of the lineages which make up the Bujinkan Dojo of Grandmaster Masaaki Hatsumi. From 10am Friday morning, through 5pm Sunday afternoon, you will progress through training drills, exercises, skills and techniques designed to advance your level of skill proficiency in this powerful martial and life mastery system. You will also learn and develop a deeper sense of understanding with select techniques from the Koto, Gyokko, Kukishinden, Takagi Yoshin, and Shinden-Fudo Ryu, which as you know, are severa; of the significant schools which make up the training in the Bujinkan and therefor the curriculum at Warrior Concepts. In addition to your Ninpo-Taijutsu training, you will also work with the rokushaku-bo "6' staff", hanbo ("half-staff"), and modern handgun for self-defense. This program is open to anyone, regardless of experience, time in training, or affiliation with Warrior Concepts or the International Bujinkan Dojo. PLEASE NOTE: The early registration discount for this event has a deadline of August 24th. There is also a strict limit of 15 participants for this bootcamp intensive. So, register now and get in early, you may use the PayPal link below to lock in your place at this event. The regular cost of this training event is $250 US. However, there is a $50 discount for anyone registered by the Friday, August 24th early registration deadline. Which means that, until then, you can attend the entire 3 days - over 18 hours of training - for just $200. ** If you want to attend but cannot arrange to be here for all 3 days, the daily rate is $75/day before August 24th, and $100/day thereafter. To register for 1 or 2 days only, please send an email request for the special PayPal registration link you need. But, please note that we are limiting the attendance for this event to no more than 15 students, to insure that everyone gets the attention, feedback, and help they need from Shidoshi Miller. This Advanced Student Packet lays out the physical, mental, and life mastery areas required for advancement in Shidoshi Miller's Black Belt Ninjutsu curriculum. 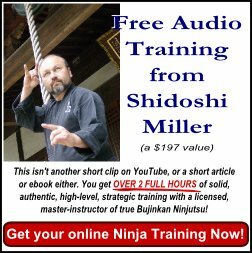 In addition to the detailed description of everything that we will be covering during this intensive, there is also a skill proficiency outline for the serious student which highlights the major training goals, as well as the primary principles and concepts, in the advancing levels of Mastery in Shidoshi Miller's curriculum. As a participant at this event, you will receive the entire collection of videos shot during this special training event. This is like getting two trainings for the price of one! Rather than simply relying on your notes from training, you will receive access to every video clip, of every technique, lesson, and kata taught during this bootcamp intensive. When finished, these videos alone will sell for $197 - $297, but you get them free as an added value for being a part of the training. Then, when everything is ready, we will send your information packet with details for choosing a hotel/motel, how to find the dojo, what to bring with you, and generally how to get the most out of your training experience. Remember... there are only 15 11 spots available for this event - including those for Shidoshi Miller's Musha Shugyo students.